Earlier this month - in the first spell of good weather - we went down to Kew Gardens twice in one week. We also left the gardens via the Brentford Gate and walked on the towpath next to the River Thames wile the tide was out. 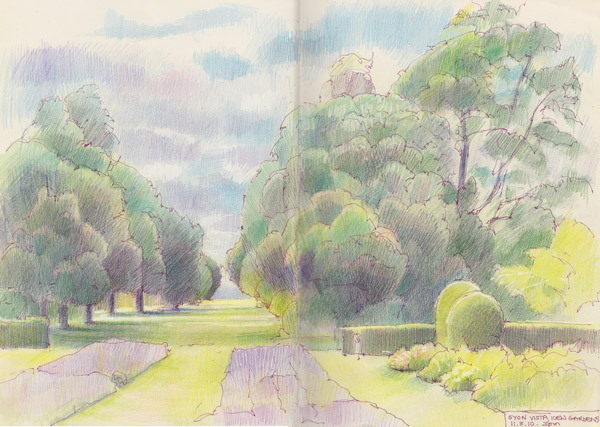 I sketched this view sat nearly opposite Syon House. I started it on the Monday and finished it on the Thursday. It has the soft hazy colours of a warm day which started with fog! 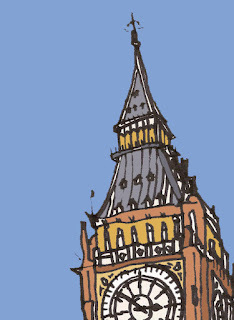 pen and ink and coloured pencils in Moleskine sketchbook, 11" x 16"
Big Ben is leaning, it has been announced by surveyors, although at 0.26 degrees (about 8.5 inches at the height of the clock) it will take, they somehow estimate, about 10,000 years to reach the same angle as the tower at Pisa, which is standing at around four degrees. The tower’s gradually shift, hardly helped by having the Jubilee tube line running beneath it, isn’t being treated as an emergency. Renovation work isn’t expected to start before 2020. If you’re coming to London for the Olympics, it should still be standing. For me, both a graphic designer and illustrator, drawing is rather a process of thinking rather producing a finished piece. I love to think about how things look like, and drawing helps me with this, so sketching is a big part of my profession. 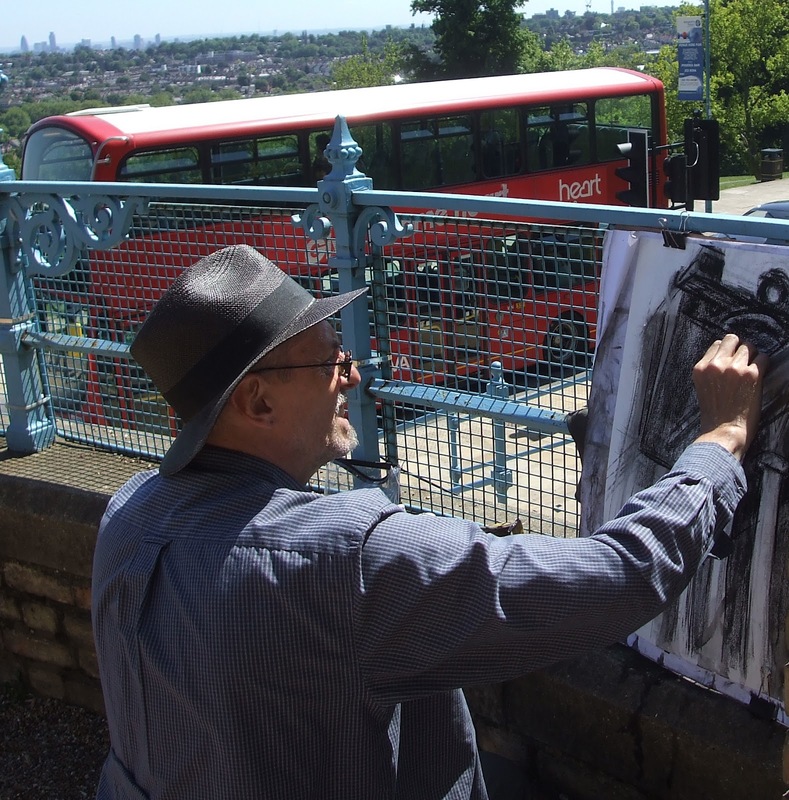 Regrettably, my full-time work schedule does not allow me to do full-scale sketching sessions too often, so most of the time I do a sketch on the go, whenever I am - so any place around London will suit me as a sketcher. 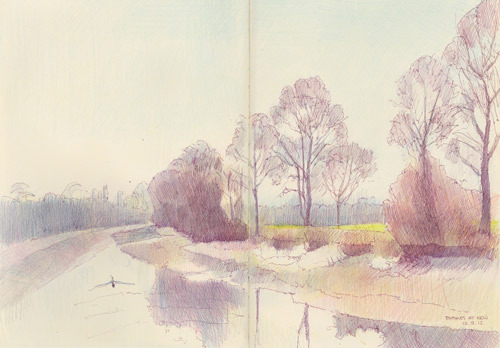 I love working on along Regents canal, sketching birds, trees and people in the parks, or make a quick street scene from a cafe window, especially when it's cold outside. I love trying all of the art materials and exploring how different materials work together in a sketch. 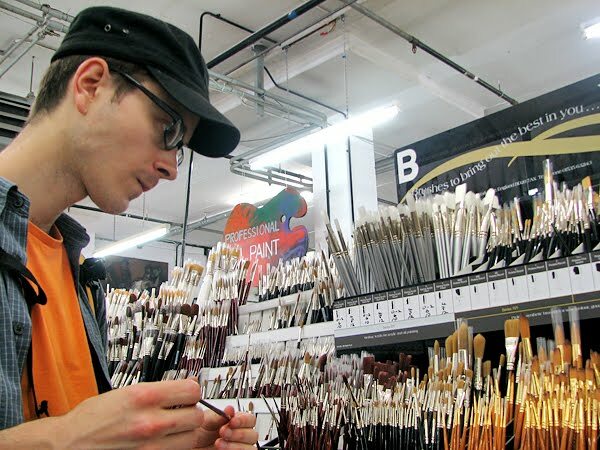 When I go out of the house, I just grab something that lies on my work table - a bunch of colour pencils, a waterbrush, a watercolour box or just a ballpoint pen. All the materials are worth exploring and give a new dimension to my work. Visit my blog and check out my flickr. 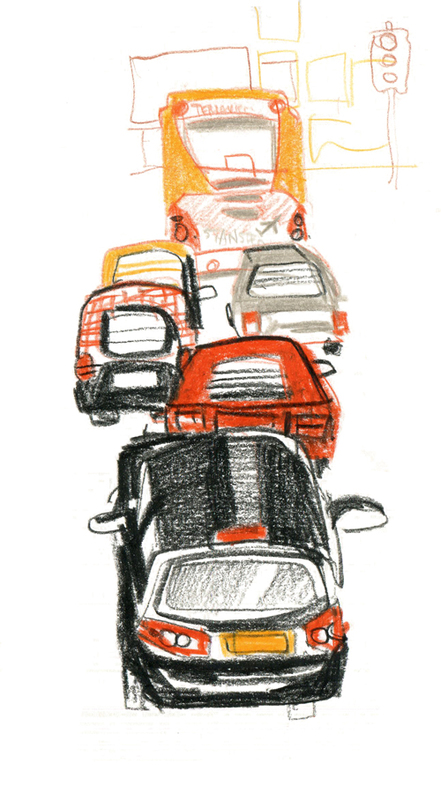 Traffic jam, colour pencils, from an upper deck of a double decker bus. Tower Bridge at night always has a romantic feel for me, my wife and I frequented the place while courting and it always brings back pleasant memories. 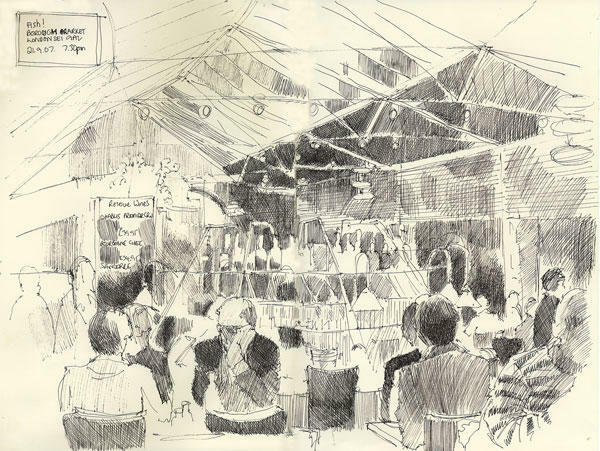 This sketch was completed all on site with watercolour, gouache, Tom Bow Wash pens, coloured pencils and a Black Bic ball point pen. 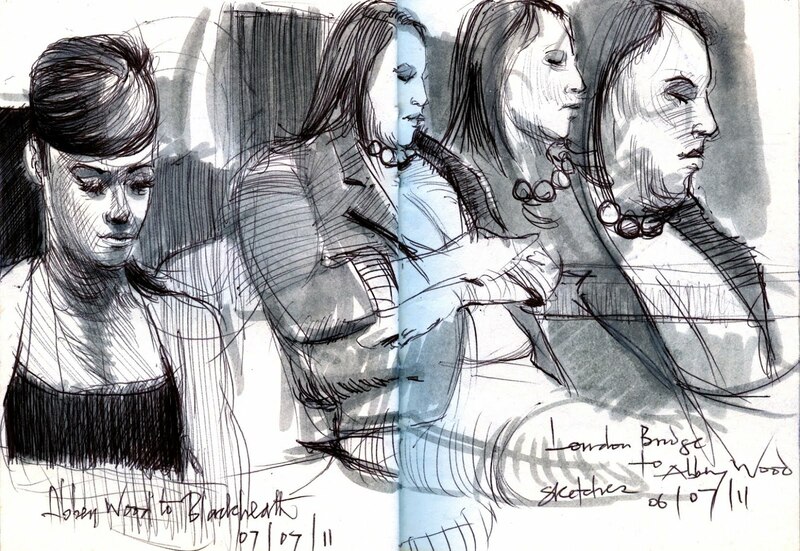 I also traveled to London Bridge on Southeastern trains and did 2 pages of sketches of commuters. 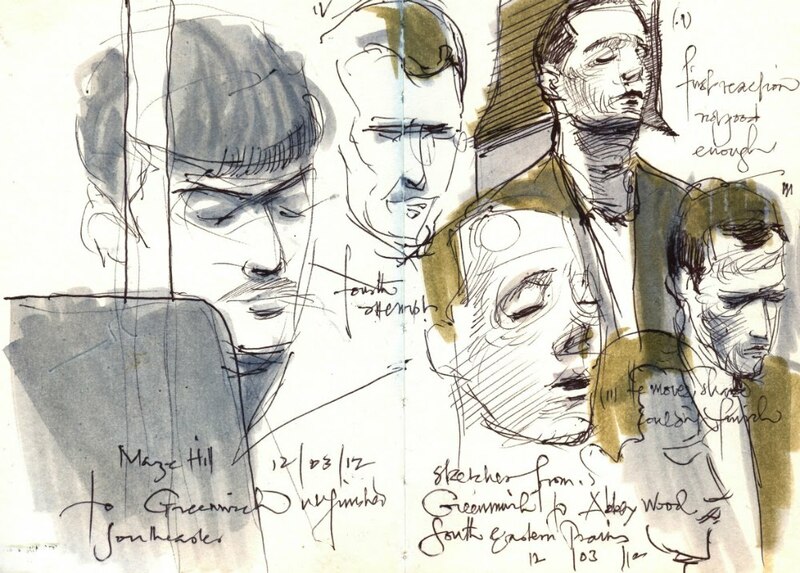 I particularly enjoyed sketching the guy with the hat on the left, the lighting in the train helped to "sculpt" his features a bit more clearly. The next set of sketches are all unfinished because the commuters all got off before I could complete a single face, but I like the feeling of having several unfinished faces on one page spread. I love drawing, and making pictures. I've been drawing for more years than I can count, but it's only in the last few years that I feel like I'm making some slow progress. Towards what? I'm not sure. Perhaps my goal is just not to be too bad. 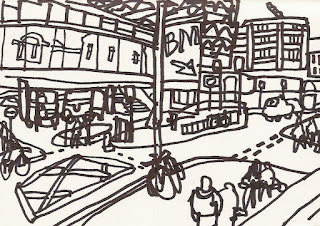 Much of the time my interest is focussed on urban themes, and I draw on location in an urban space. 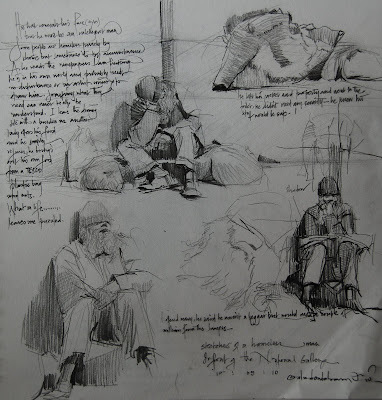 A few years ago I found the Urban Sketchers blog, and this provided an opportunity to share some of these works with an audience that has a similar set of interests. It's been a real stimulus for me, to see such a variety of urban drawing from all over the world. Sometimes I draw when I'm traveling. 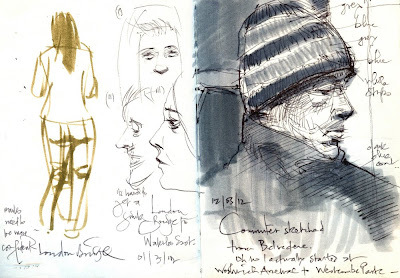 Unlike many Urban Sketcher members though, I find that travel and drawing don't complement each other well. The kind of drawings I like to do work best when I can spend time on them, without wondering what I might be missing around the next corner. 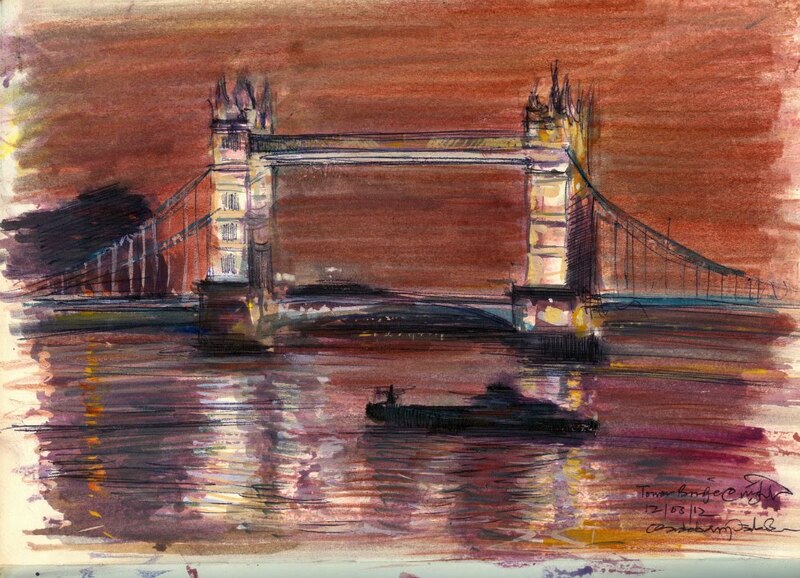 Drawing places that mean something to me is what I most enjoy, and much of my work therefore is focussed on London, where I was born and brought up. 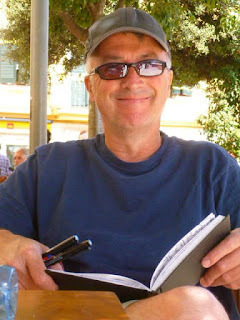 Hence I was delighted to be invited to be a correspondent for the new London-based blog. My hands start shaking, I can't keep them still, my eyes have seen a face, an interesting face. One that I cannot afford to miss. I'm on the train, it's packed full of commuters, everyone is staring at me! But I must sketch! It's an addiction, it's a compulsive habit. Something I have developed by wild practice over the years. London Public transport has every face in this world to enliven a sketchbook and once I turn to a plain page in my sketchbook the possibilities are endless. I may catch a beautiful lady putting on make up, I may grab a city workaholic stealing a nap on the 30 minute journey on the Southeastern trains to Canon Street or the faces all around me just to keep my hands busy. This is everything about me when it comes to sketching. My artillery consists of a Bic ball point pen, an A6 Daler Rowney Sketchbook and a number 75 Tom Bow wash pen(light grey). 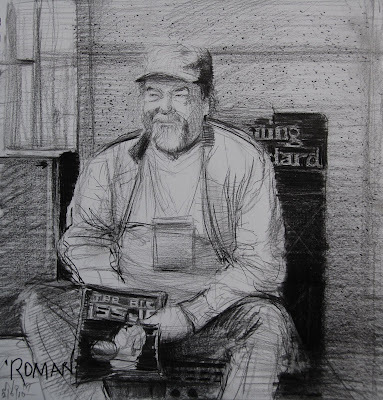 Other things fascinate me while I walk on the street- the homeless people carry the greatest weight. They are the real Londoners, they've seen life! They know the city and can tell you everything you need to know. I can't resist recording these people in my sketchbooks, sometimes they are sitting and begging, some have a good job of selling the Big Issue Magazine, some are just asleep on the road side waiting for the wake up call of a Policeman who doesn't like their positioning.....all these wrap up my desire and Inspiration behind sketching! Then comes my love for architecture, I would have been an architect if not an artist. But my God directed me where He wanted me to be after asking Him for guidance way back in 1990 when I first met Christ. Yes, architecture, the play of light on architecture is amazing, I simply love it and I love to include trees and people into my architectural scenes just to have a good contrast of the organic and inorganic. I love using pure graphite, coloured pencils and the wonderful oil base pencil for these and an A4 Moleskine sketchbook. I also do oil sketches in location too. This wraps it up for me! 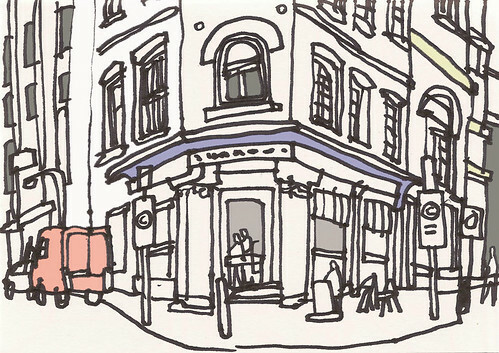 I'll be sharing my sketches of London and Londoners with you! 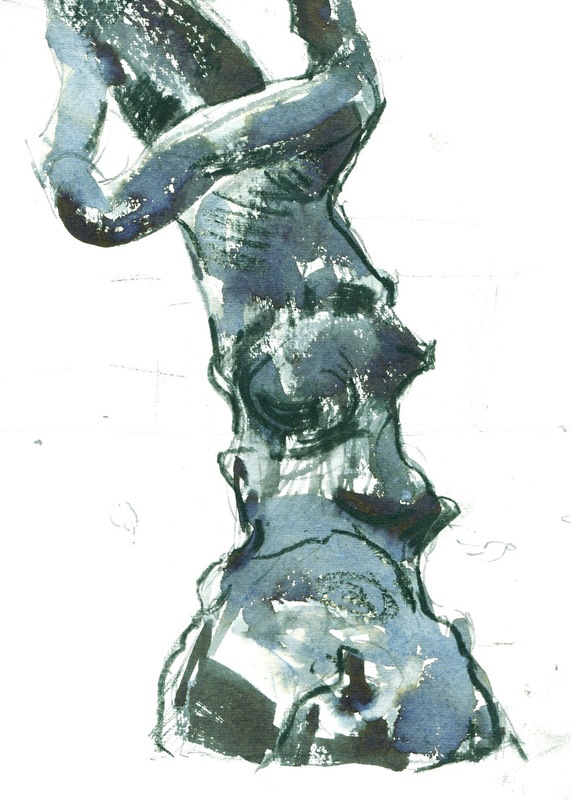 I hope you'll enjoy and subscribe to USK London! 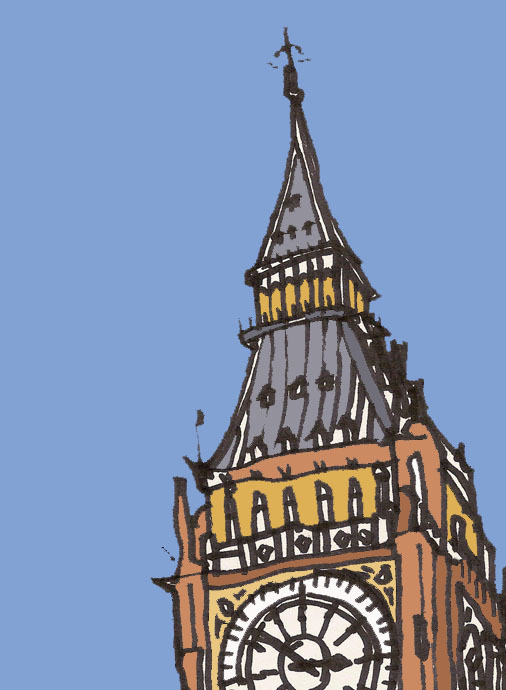 London is, of course, many different things to different people, as this blog will no doubt prove. Each of us has our own view and our own islands within the huge whole that we know particularly well. For me, this means Stoke Newington—where I live, which is an ancient inner north London village with a history of dissension that has become perhaps a little more gentrified than I would prefer—along with Hackney, Hoxton, Islington, the South Bank, the City and West End. I’m not so at home in most areas with postcodes with a “W” in them (apart from NW11) or, I must now confess, most places south of the river (apart from The Oval cricket ground). I still draw in these places when I get a chance. To have a bicycle and a sketchbook is, for me, the way to be. 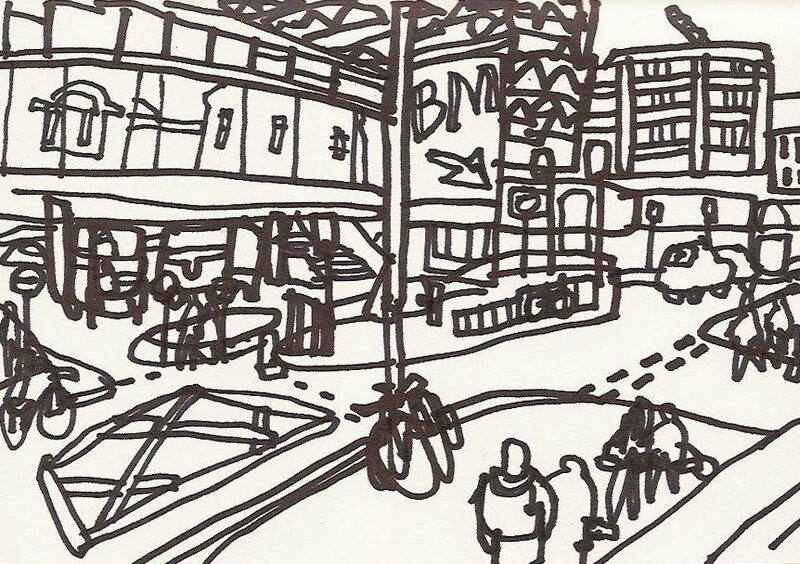 My drawings are often A6-sized or perhaps A5, and made with permanent marker pens. I’m quite happy to work on the back of an envelope. Taking quiet, off-piste cycle routes can lead to unexpected pleasures, usually unfrequented by tourists and yet gloriously cosmopolitan and multicultural, which is how I like my London to be. London can be ugly and violent, but it’s usually not, and I love to live here and have my children grow up here. Drawing it is a kind of hymn of praise to the city, warts and all. 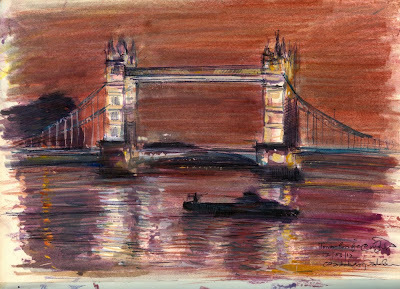 I show at Skylark Galleries, an artist-run gallery in the Oxo Tower Wharf on the South Bank, and the Art Agency, Esher. I was for a while the editor of Artists & Illustrators magazine, and am now a freelance journalist. Five of my images of London scenes have just gone on sale as A5-sized art cards at IKEA stores worldwide. You can see more of my work at www.james-hobbs.co.uk, visit my blog or follow me on Twitter. 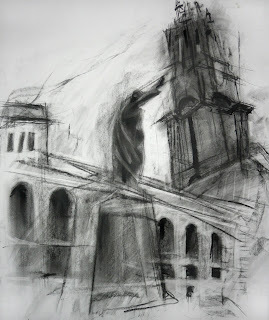 I've been sketching on a regular basis for about twenty years. 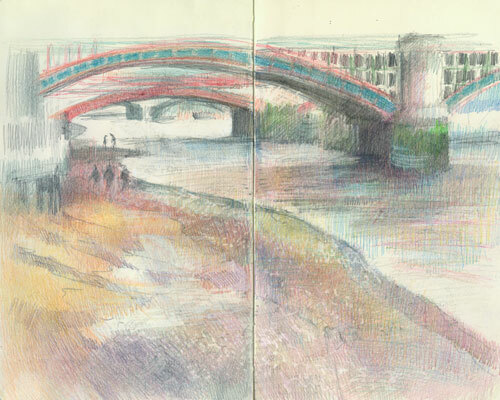 I now carry a sketchbook all the time and use pen and ink and coloured pencils to record my sketches of different places in London. Six years ago I started to post my sketches on my blogs, then in October 2008 I became a member of Urban Sketchers. 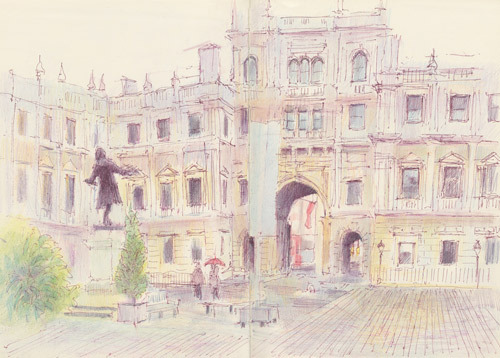 I'm now very proud to now be a founder member of Urban Sketchers London. 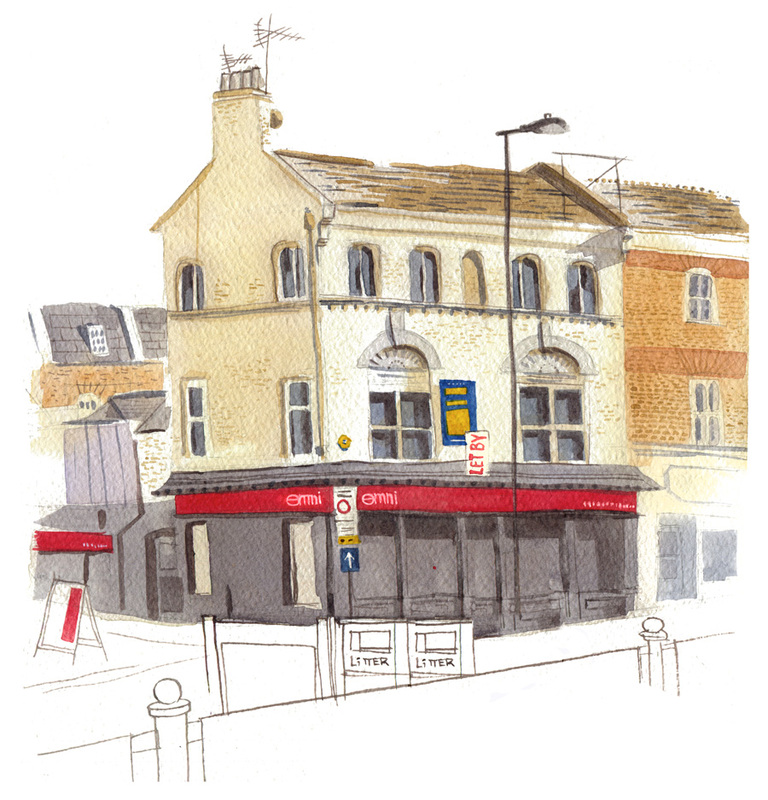 The best bit about sketching for me is the way it helps to remember a place so much better than any photo I could ever take. I also sketch because it helps me to 'see' pictures everywhere I go. It also gives me a better record of colours than photos and helps me draw fast - which means I get to sketch more and more! 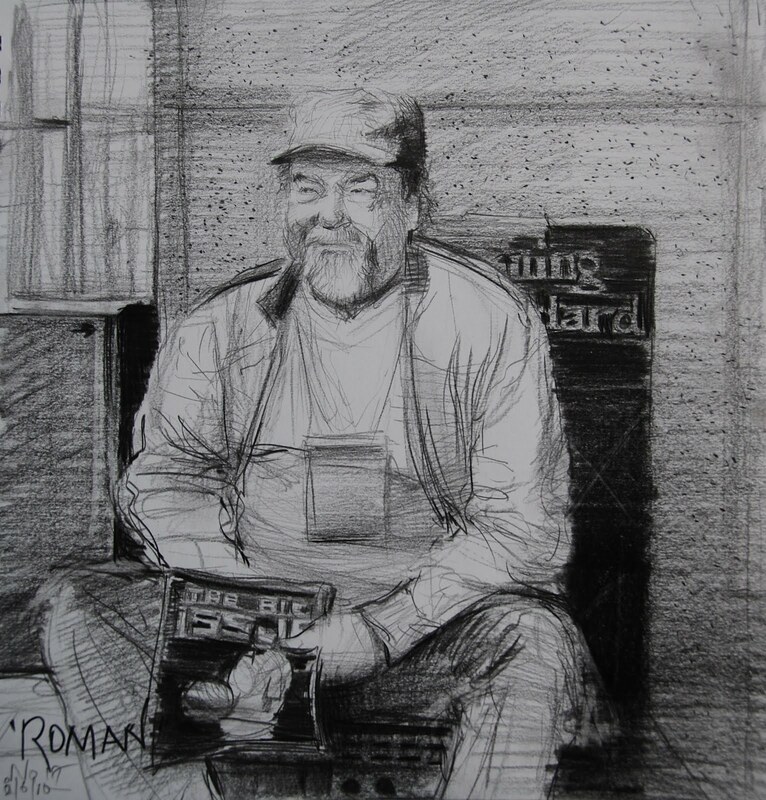 I love the challenge of creating composite sketches out of the people who come and go in galleries and cafés. 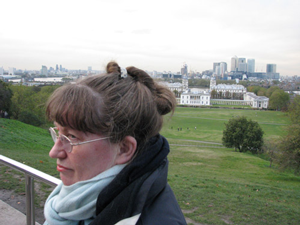 ....and the views and heritage associated with the River Thames — like the view of London and the Thames from Greenwich Park in my photo - and the views of the Thames at Bankside outside Tate Modern below. 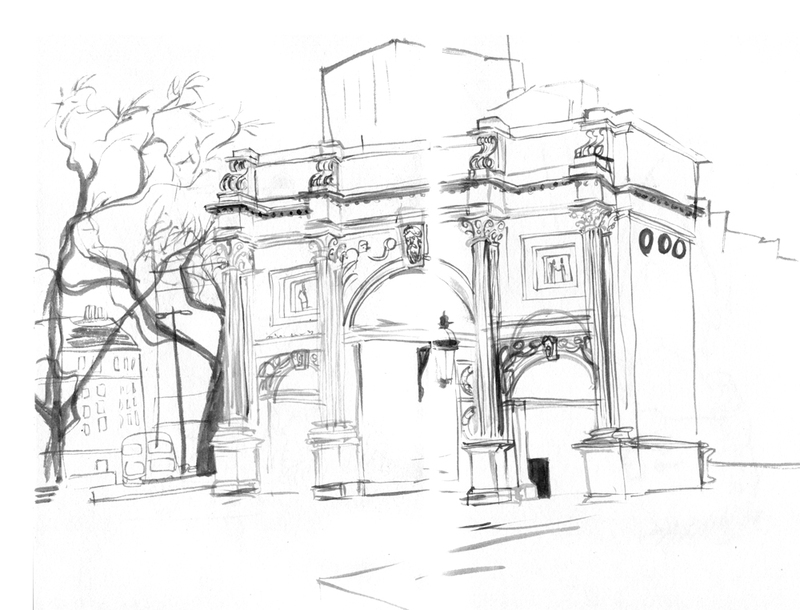 I also enjoy sharing information about the places seen in my sketches and the practical aspects about good places to go to sketch on my blog. I'm using it to create a virtual sketch trail about different areas I've visited. I also love botanical art - and you can see one of my drawings at the 2012 Annual Exhibition of the Society of Botanical Artists - at Westminster Central Hall next month - 20-29th April 2012.